The recital of Hannah Knutson is presented in partial fulfillment of the requirements for the Bachelor of Music degree. Hannah is from the studio of Dr. Yi-Lan Niu. 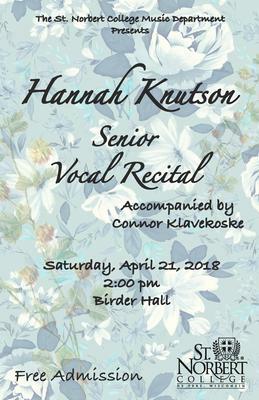 St. Norbert College Music Department, "Senior Recital - Hannah Knutson" (2018). Music Performances. 48.